(Lour.) Raeusch. ex Schult. & Schult.f. Bambusa floribunda (Büse) Zoll. & Mor. ex Steud. Bambusa glauca Lodd. ex Lindl. Bambusa sterilis Kurz ex Miq. The cultivar 'Alphonse Karr, growing in the McConnell Arboretum and Botanical Gardens, Turtle Bay Exploration Park, Redding, California, USA. Missouri Botanical Garden Press; St. Louis. An excellent, comprehensive resource in 25 volumes. In addition to the botanical information the flora also gives basic information on habitat and some uses. An on-line version is also available. Seethalakshmi K.K., Muktesh Kumar M.S. A very good book giving botanical descriptions of the plants with brief notes on subjects such as uses, habitat and range. It is also available to view on the Internet. The plant is sometimes harvested for its edible young shoots and culms that are used for weaving, paper making etc. Plants are widely cultivated in the tropics as ornamentals and in hedges. Trees and Shrubs Hardy in Great Britain. Vol 1 - 4 and Supplement. A classic with a wealth of information on the plants, but poor on pictures. E. Asia - Eastern Himalayas to southern China. Excellent book, covering over 1,500 species of useful plants from Nepal together with information on the geography and peoples of Nepal. Good descriptions of the plants with terse notes on their uses. Fairly comprehensive, it was once the standard work but is now rather dated. Deals with species hardy in Britain, giving cultivation details and some uses. Very readable, giving lots of information on the uses of bamboos, both temperate and tropical. ], but it does not like periods of prolonged cold. 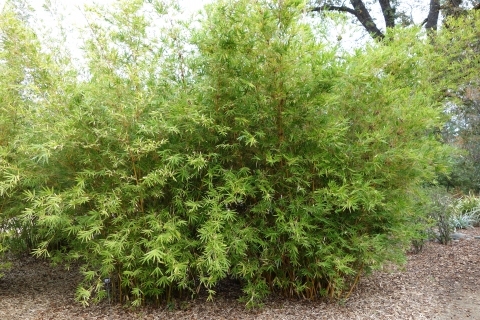 Bamboos in general are usually monocarpic, living for many years before flowering, then flowering and seeding profusely for a period of 1 - 3 years before usually dying. Tanaka's Cyclopedia of Edible Plants of the World. Tanaka. T. & Nakao S.
The most comprehensive list of edible plants I've come across. Only the briefest entry for each species, though, and some of the entries are more than a little dubious. Not for the casual reader. Cornucopia - A Source Book of Edible Plants. Excellent. Contains a very wide range of conventional and unconventional food plants (including tropical) and where they can be obtained (mainly N. American nurseries but also research institutes and a lot of other nurseries from around the world. Excellent range of photographs, some cultivation details but very little information on plant uses. Lots of information on the uses of the plants of SE Asia. A Dictionary of Plants Used by Man. Forget the sexist title, this is one of the best books on the subject. Lists a very extensive range of useful plants from around the world with very brief details of the uses. Not for the casual reader. An excelllent little booklet that looks in some detail at the native bamboos of Nepal, including looking at their uses. Seed - surface sow in containers as soon as it is ripe, preferably at a temperature around 20°c. Do not allow the compost to dry out. Germination usually takes place fairly quickly so long as the seed is of good quality, though it can take 3 - 6 months. Prick out the seedlings into containers when they are large enough to handle and grow on in a lightly shaded place until large enough to plant out. Plants only flower at intervals of many years and so seed is rarely available. Captcha: a square has how many sides?